Each day brings more reminders that Parker is growing up. One of the latest is our transition to baths in the BIG tub! He kept trying to climb out of his baby tub so it was getting a bit dangerous. As I have mentioned before, he LOVES taking baths, but he wasn't sure what to think of sitting in the big tub. We have an old cast iron/ceramic tub that is hard and cold so I made sure to get one of those tub pads to make it more comfortable. He thought that this was strange! It didn't take too long for him to warm up to this new era of tubby time. My curious guy...I love this one. We have seen a bit of a boom in Parker's communication over the last few weeks. He has been "saying" ma ma" and "da da" for a while, but it is sometimes hard to tell if those are directed to us or just baby babble. The noises he makes and intonation he uses have changed significantly. We have also noticed that his level of understanding is increasing as well. It is fun to know that he understands things I say to him or ask of him. We have been trying to get some of this on video for a while, but he kept being camera shy! We finally captured it a few days ago. Hello! It may not have been a perfect "hi," but it was wonderful in THIS mama's eye! I am so excited to see how his speech and communication changes over the next several months. A long belated Christmas post! I will likely spend the next few days updating you on all the happenings at the Herrmann house. It has been a tough couple months, with lots of sickness going around. In December we all got a stomach bug, followed swiftly by "flu-like symptoms." Parker seems to be a revolving door of colds and coughs that Jimmy and I have also been victim to. Other than the ickiness, the holiday season was pretty fun! While it wasn't Parker's first Christmas, it certainly was a LOT different than last year. We woke up pretty early on Christmas morning and let Parker "open" his presents. He was more into banging on the packages than opening. I ended up unwrapping most of the gifts for him. Mega Blocks and a new book! We headed to my parents house shortly after this to start the days festivities. Coordinating so many family functions can get tricky, but we made it work. We ate breakfast and opened presents with the whole family! 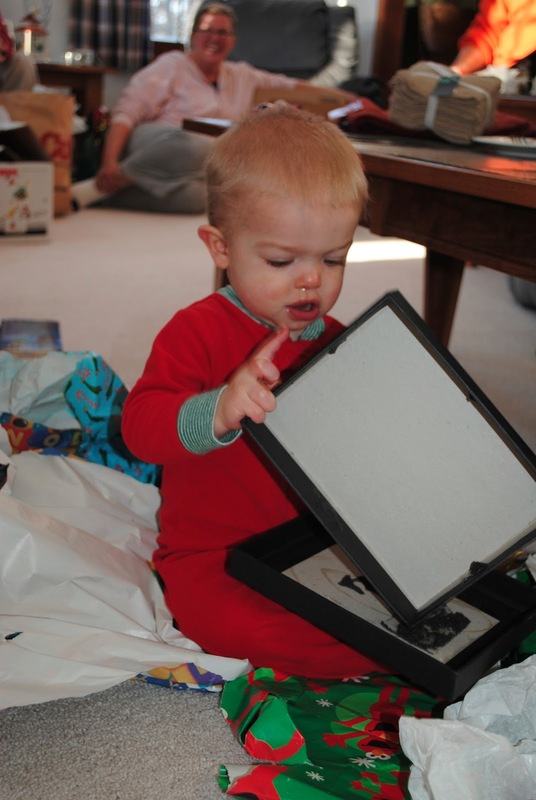 Once again, Parker was more interested in the boxes and paper than the gifts he received. We spent the rest of the day eating and chatting and just hanging out. That is my favorite kind of holiday! We also got a picture of the whole clan! Not sure the last time that happened, maybe never! I hope you had a holiday season as special as ours! I cant wait till next year!